Posted February 24, 2015 by Michael Kelly, GIY Ireland in Features. 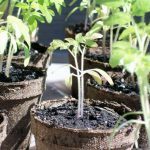 Tomatoes have a long growing season so to get good fruit you need to get the plants started early (if you are growing from seed). I sow my tomatoes on a heating mat in the potting shed in mid February, so by early March they have germinated. This year I am sowing five varieties of tomato: the delectable cherry, Sungold, Lucky Leprechaun (Irish Seed Savers variety), Black Russian, Tigerella and Sweet Aperitif. I sow ten tomato seeds in a 9cm pot (one pot for each variety) and pretty much as soon as they germinate, I move each seedling on to its own individual 5cm pot. This process is called pricking out (which is a term that would put me in to a fit of the giggles if I was really immature, which I might add, I am not) and it’s the act of moving very young seedlings from the pot they’ve germinated in to another container or bed to provide more space. It’s a little different to transplanting, which is where we move a more established seedling to its final growing position in the soil. 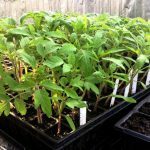 Pricking out is a delicate little operation, and you have to be very careful not to damage the root or stem of the seedling. Having filled the 5cm pot with seed compost, I make a decent sized hole in the compost with my finger. Then using a plant label I ease one of the seedlings out of the pot, holding it very gently by the leaf. I then place the seedling in to the hole in the new pot, sprinkle a little compost in around it, firm it in gently and water. It’s important to keep a close eye on seedlings at this time of year—a daily check-in to see if they need watering is important at this very vulnerable stage in their development. With the cold nights, I am also covering my seedlings with fleece at night time. I’m struck by how quickly space on the heating mat becomes prime real estate. 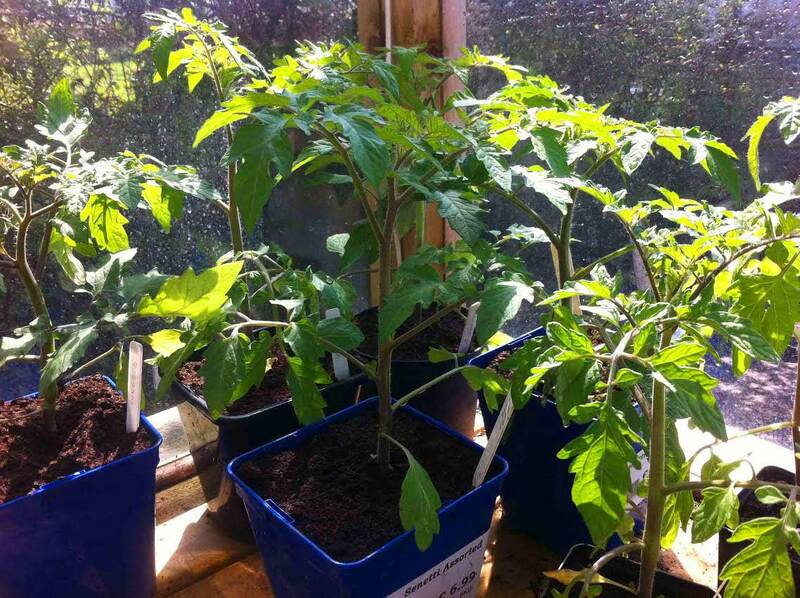 From just 5×9cm pots of toms, there are now 50 individual little 5cm pots (one for each seedling). The growing year is hotting up..! By joining GIY you help us to continue the work of supporting people just like you to grow food at home, at school, in the workplace and in the community—each year we support over 50,000 people and 800 community food growing groups and projects. It costs just €35 to join GIY for a year, and to say thanks we will send you a seasonal copy of our supporter’s magazine GROW and some GIY seeds for you to sow each quarter. We will also send you our weekly tips, news and advice ezine and offer you discounts to GIY events like the annual GROW Summit. Join today at www.GIYireland.com. Continue to prepare ground—there is still time to prepare a plot to grow veg this year. Fork or rake over existing beds, breaking up large clods of earth. 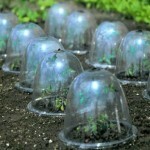 Cover new seedlings with fleece if a frost is due. Start your daily slug patrols and lay beer traps. Don’t let new-season weeds take over—get on top of them with weekly hoeing. Indoors: lettuce, aubergine, peppers, cucumbers, celery, celeriac, sweet corn, basil, leeks, summer cabbage, cauliflower, Brussels sprouts, parsley, courgette, French beans. Sow outdoors or under cover: broad beans, red cabbage, carrots, cauliflower, spinach, kale, Brussels sprouts, onions, leeks, turnip, peas, radishes, early lettuce, asparagus. Plant your first early seed potatoes, as soon as weather conditions allow. This month you could be enjoying (from the ground and from storage) onions, leeks, parsnips, potatoes, some varieties of lettuce, mint, sprouting broccoli, kale, rhubarb, chard, the first of the spring cauliflowers and cabbage, and spinach (perpetual, spinach beet). This feels more like a broth than a soup, but it’s delicious and makes a virtue of kale which is so wonderfully in-season at the moment. This will make a great healthy lunch or if you want to turn it in to a hearty supper, add 100g of cooked pasta (something small like macaroni) and serve with crusty bread. Serves 6. In a large saucepan on medium heat, add coconut oil and onions and cook until softened. Add in celery, carrots, and garlic and cook until the mixture is nice and caramelized and cooked through. Add herbs, spices and a good sprinkling of salt and pepper and stir well. Pour in the vegetable stock, beans, and kale. Cook for 1–2 hours on a medium heat until the beans and carrots are tender. 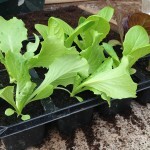 As we have now moved in to March, this week I tried my first sowing (on a heating mat indoors in the potting shed) of lettuce, annual spinach and oriental greens (mustard, pak choi, rocket) for later transplanting out in to the polytunnel. This is the start of my monthly succession sowing of all these vegetables, which I will sow at the start of each month between now and August. I generally sow two 8-module trays of lettuce, two of annual spinach and two of oriental greens—I’ve found this is enough to give me a pretty consistent supply of each, without any major shortages or gluts. 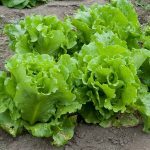 16 heads of lettuce a month (4 a week) should be enough for most people! Later in March, the seed sowing really starts to heat up. Early potatoes will go in the ground outside some time after Paddy’s Day and before end of month. In the potting shed (for later transplanting), I will be sowing my celeriac crop and the first succession sowings of calabrese, cauliflower, celery and scallions. © GIY Ireland 2015—all rights reserved.